Following installation of an AXYZ 4022 CNC router in February of this year, Wythenshawe, Manchester-based Kids Funtime Beds has increased production by a staggering 50 per cent. Established in 2013 as a sole trader and subsequently adopting limited status, the company specialises in the manufacture of customised bunk beds that are designed exclusively for children. Available in different designs and formats, the beds combine beautiful patterns, colour themes and additional structural features to harmonise with a child’s sense of adventure and fun with functionality to ensure a high level of safety, both of which requirements the company is said to have worked tirelessly to achieve. Following a visit to the Joinery and Furniture Exhibition at the NEC, Tony Smith met up with AXYZ’s Technical Sales Engineer, Chris Perry, who invited him to test one of the AXYZ machines at the company’s main facility in Telford. Tony Smith continued: “The routing/cutting capability demonstrated by the machine was faster and more accurate than anything we had experienced with our already installed machines and the knowledge and experience of the AXYZ team of engineers and the service we realised they were capable of providing made the decision to purchase a formality. 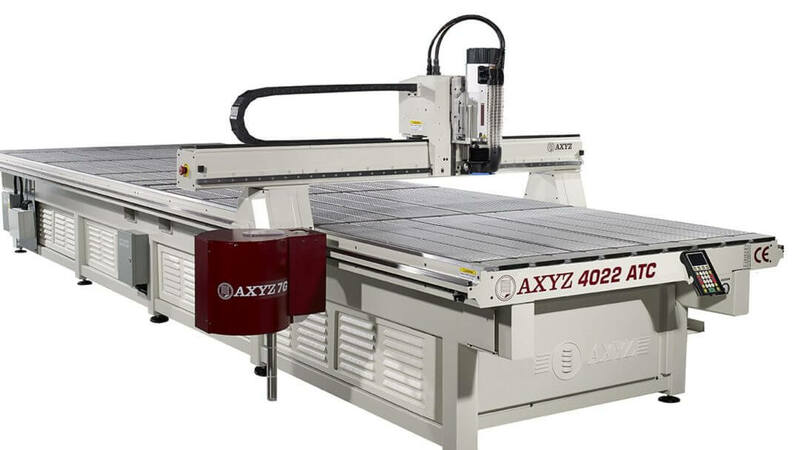 The AXYZ 4022 router now installed at the Kids Funtime Beds facility is a twin-bed CNC machine incorporating the AXYZ Automatic Tool Change (ATC) facility and special pins that ensure the accuracy of panel placement. It has a processing area of 6.7 metres (length) x 1.5 metres (width) and is used primarily to cut 8 x 4 18-mm MDF for the bed panels. The router is supported by VCarve software that is particularly ideal for 2D and 3D profiling work. As with all AXYZ routers, the 4022 machine can be supplied with a host of optional production tool enhancements. These include the AXYZ Auto Zone Management facility that ensures the material being processed is always held securely during the routing/cutting process and the A2MC machine controller with integrated AXYZ Vision System (AVS) for greater accuracy and quality of cut. These are supplemented with the latest helical rack and pinion drive system that incorporates a multiple gear teeth arrangement. This helps spread the workload more evenly and results in faster throughput times, reduced material wastage, quieter operation and ultimately a longer than normal machine life.